Today's featured September Skincare Series product(s) keep my skin oh so supple and soft: Ole Henriksen's Nurture Me and Express the Truth. Real talk...these products are seriously the truth! They do exactly what they say they will. Nurture Me is an intensely hydrating crème that contains oils like primrose and wheat germ that help recondition the skin. It also contains vitamins A, C & K, which smooth out the skin's surface. This moisturizer is awesome for dry skin, and I know because unfortunately, I suffer from excruciatingly moisture-deficient skin. I've also noticed that after slathering my face in Nurture Me or Express the Truth before going to sleep, they help me get rid of dry, flaky Eczema patches on my face once I do my AM cleanse. 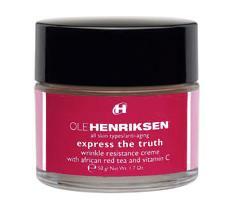 Express the Truth is a deeply nourishing uber-moisturizer containing antioxidants such as ester C and African red tea that help soothe the skin. It also contains polylysine, an all-natural peptide that vastly improves skins elasticity and muscle tone and helps keep deep wrinkles at bay! This crème protects, lifts and quintessentially assists in the repair of skin overnight. It's really the TRUTH! I've used both of these, and I must say, each product improves the overall look, tone and actual texture of my skin. I'm so glad I gave them a shot! I think you can really see the results if you use them before bedtime. I can honestly say...when I wake up in the morning after using either one, my skin looks and feels divinely renewed. The downside is the price tag...$40 for the Nurture Me and $65 for the Express the Truth, and you only get 1.7 oz per jar. If you head on over to Skinstore right now though, they are offering 20% off of each order with the promo code SEP20. If you want to purchase, maybe that will help cushion the blow a bit! :-) Additionally, the site also offers cosmetics and other products from companies we all know and love like Too Faced and Philosophy.